It’s not quite official yet, but it’s a near-certainty that the next Call of Duty is Black Ops IV. Rumors have been swirling about this for a few weeks now (as first reported by Eurogamer), and Kotaku can confirm via our own sources that those rumors are true. Plus, there’s tonight’s assist from a future NBA MVP. En route to tonight’s game against the Oklahoma City Thunder, Houston Rockets superstar (and soon-to-be 2018 MVP) James Harden dressed up in full camo along with a hat that sure looks like the Black Ops III logo extended by one. Of course, the roman numeral for 4 is “IV,” so there’s no indication that this is the actual logo for Black Ops IV. 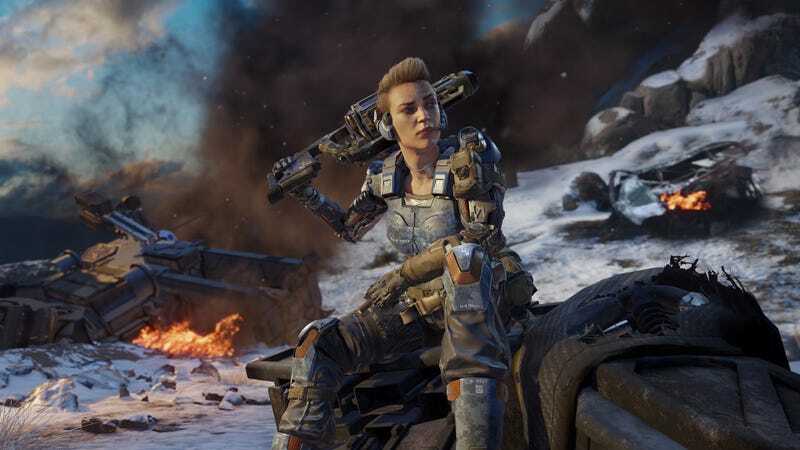 But we’ve heard from two people familiar with the game’s development that the next Call of Duty is indeed a fourth Blops, to be developed by Treyarch, the studio behind the first three Black Ops games. Just like those games, it’ll take place in a near-future setting. No word on whether James Harden will be a character. Activision didn’t immediately respond to a request for comment. It’s not clear whether Harden is having some fun with rumors or helping launch a viral marketing campaign for the next Call of Duty, but we really, really hope it’s the former. UPDATE (10:03pm): Shortly after publication, one source confirmed that Harden is indeed wearing the official logo for, uh, Black Ops IIII.